"This Latin-inspired steak pairs perfectly with rice and beans. Slice leftovers really thin and serve on crusty day-old rolls for an amazing lunch or snack afterwards." Place cumin seeds into a small skillet over medium heat; stir constantly until seeds turn dark brown and smell toasted, about 1 minute. Immediately pour seeds into a bowl to stop the cooking. Mix cumin seeds with orange juice, vegetable oil, steak seasoning, lime juice, and oregano in a bowl. 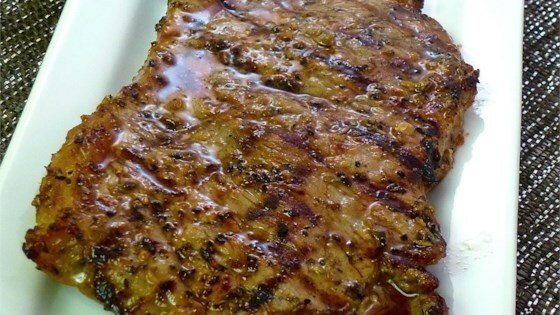 Place steaks into a large resealable plastic bag, pour orange juice marinade over the meat, and squeeze out air. Seal bag and turn it over several times to coat meat with marinade. Refrigerate at least 30 minutes, or longer for extra flavor. Remove steaks from marinade, shaking off any excess. Discard used marinade. Grill steaks on the preheated grill until seared on the outsides and still slightly pink in the centers, 6 to 8 minutes per side. An instant-read meat thermometer inserted sideways into the center of the thickest steak should read 145 degrees F (65 degrees C). Let steaks rest for 3 minutes before slicing. Flavor is good, but Rib Eye is always tender. Wow! This was an incredible meal. I made this for my wife and I exactly as stated. The meat was tender, moist and tasty. I made garlic roasted potatoes and green beans for sides. Three big steaks quickly devoured by my boys and me, prepared exactly as described. Fantastic marinade.